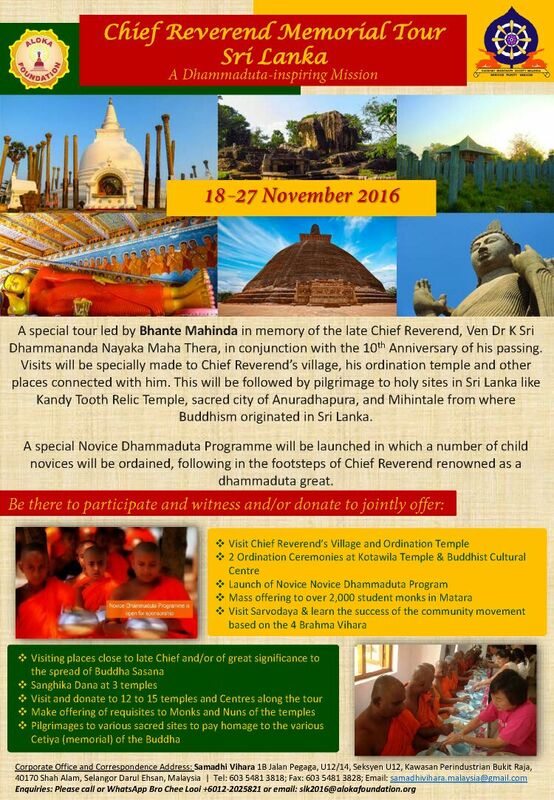 A special tour led by Ven Mahinda in memory of the late Chief Reverend, Ven Dr K Sri Dhammananda Nayaka Maha Thera, in conjunction with the 10th Anniversary of his passing. Visits will be specially made to Chief Reverend’s village, his ordination temple and other places connected with him. This will be followed by pilgrimage to holy sites in Sri Lanka like Kandy Tooth Relic Temple, sacred city of Anuradhapura, and Mihintale from where Buddhism originated in Sri Lanka. A special Novice Dhammaduta Programme will be launched in which a number of child novices will be ordained, following in the footsteps of Chief Reverend renowned as a dhammaduta great.